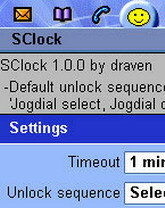 SClock - a small utility that locks the keys of your phone after a user configurable time of inactivity. A fullscreen clock with time and date is drawn when the keys are locked. Note: this application only works in Flip Open mode, so basically those who have hardware flip attached won't find this application useful at all.